When cooled down to a fraction of a degree above absolute zero, the four dark elements at the center of the circuit in the middle of this image can represent digital data using quantum mechanical effects. Topological quantum computing (TQC) is a newer type of quantum computing that uses “braids” of particle tracks, rather than actual particles such as ions and electrons, as the qubits to implement computations. Using braids has one important advantage: it makes TQCs practically immune to the small perturbations in the environment that cause decoherence in particle-based qubits and often lead to high error rates. Ever since TQC was first proposed in 1997, experimentally realizing the appropriate braids has been extremely difficult. For one thing, the braids are formed not by the trajectories of ordinary particles, but by the trajectories of exotic quasiparticles (particle-like excitations) called anyons. Also, movements of the anyons must be non-Abelian, a property similar to the commutative property in which changing the order of their movements must not change their final tracks. In most proposals of TQC so far, the non-Abelian statistics of the anyons has not been powerful enough, even in theory, for universal TQC. “The mysteries are just piling up.” You can’t split an electron, right? Wrong. Physicists Gil Refael and Jason Alicea explain the unique properties of electrons constrained to a 2 Dimensional world, and how they can be used to make noise-proof Quantum Computers. One of the striking features of a qubit is that, unlike a classical bit, it can be in two states at the same time. That is, until a measurement is made on the qubit, causing it to collapse into a single state. This measurement process and the resulting collapse may at first seem irreversible. (Once you open the box to find a dead cat, there’s no going back, right?) But recently physicists have been investigating the possibility of “uncollapsing,” or recovering the state of, a qubit that has been partially collapsed due to a weak measurement. The results could be used for implementing quality control in quantum systems. In a new paper published in Physical Review Letters, physicists J. A. Sherman, et al., at the University of Oxford, have experimentally demonstrated a recovery method that can restore the state of a single qubit, in principle perfectly, after it has partially collapsed…..
With just a single atom, light can be switched between two fibre optic cables at the Vienna University of Technology. Such a switch enables quantum phenomena to be used for information and communication technology. The Quantum Light Switch: It can occupy both possible states at the same time. Fibre optic cables are turned in to a quantum lab: scientists are trying to build optical switches at the smallest possible scale in order to manipulate light. At the Vienna University of Technology, this can now be done using a single atom. Conventional glass fibre cables, which are used for internet data transfer, can be interconnected by tiny quantum systems. Professor Arno Rauschenbeutel and his team at the Vienna University of Technology capture light in so-called “bottle resonators”. At the surface of these bulgy glass objects, light runs in circles. If such a resonator is brought into the vicinity of a glass fibre which is carrying light, the two systems couple and light can cross over from the glass fibre into the bottle resonator. 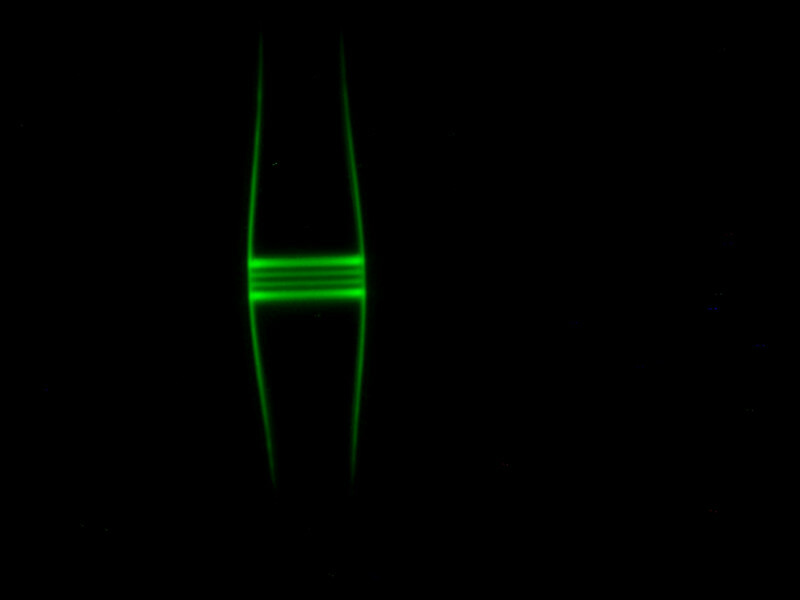 Light in a bottle: An optical fibre with a captured beam of light. “When the circumference of the resonator matches the wavelength of the light, we can make one hundred percent of the light from the glass fibre go into the bottle resonator – and from there it can move on into a second glass fibre”, explains Arno Rauschenbeutel. This system, consisting of the incoming fibre, the resonator and the outgoing fibre, is extremely sensitive: “When we take a single Rubidium atom and bring it into contact with the resonator, the behaviour of the system can change dramatically”, says Rauschenbeutel. If the light is in resonance with the atom, it is even possible to keep all the light in the original glass fibre, and none of it transfers to the bottle resonator and the outgoing glass fibre. The atom thus acts as a switch which redirects light one or the other fibre. 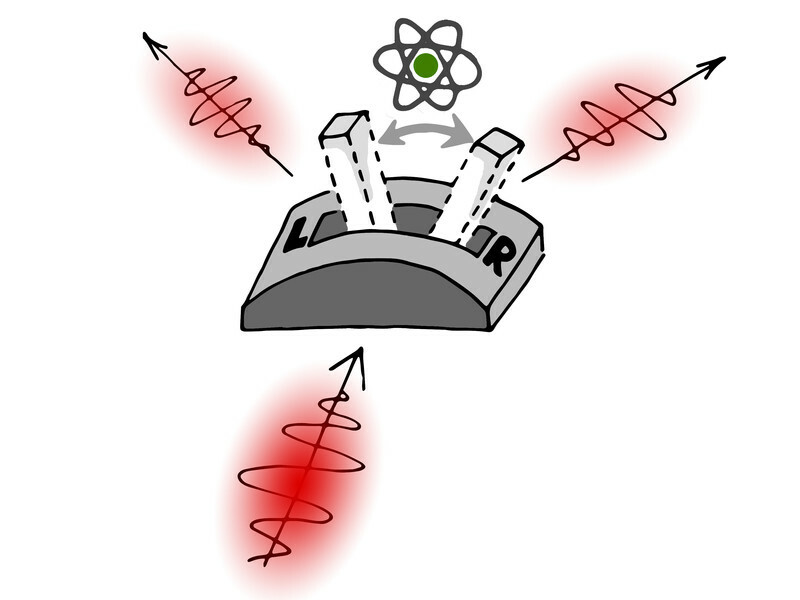 In the next step, the scientists plan to make use of the fact that the Rubidium atom can occupy different quantum states, only one of which interacts with the resonator. If the atom occupies the non-interacting quantum state, the light behaves as if the atom was not there. Thus, depending on the quantum state of the atom, light is sent into either of the two glass fibres. This opens up the possibility to exploit some of the most remarkable properties of quantum mechanics: “In quantum physics, objects can occupy different states at the same time”, says Arno Rauschenbeutel. The atom can be prepared in such a way that it occupies both switch states at once. As a consequence, the states “light” and “no light” are simultaneously present in each of the two glass fibre cables. 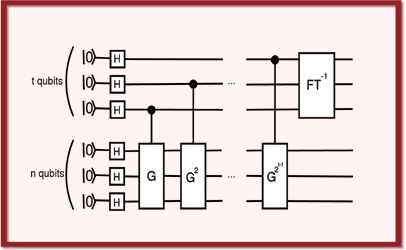 For the classical light switch at home, this would be plain impossible, but for a “quantum light switch”, occupying both states at once is not a problem. “It will be exciting to test, whether such superpositions are also possible with stronger light pulses. Somewhere we are bound to encounter a crossover between quantum physics and classical physics”, says Rauschenbeutel. Fin 2009, des chercheurs français publiaient une avancée déterminante pour la fabrication d’un ordinateur quantique : un dispositif de lecture haute fidélité d’un bit quantique. 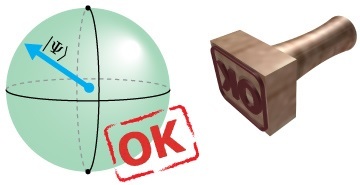 Retour sur cette découverte à l’occasion du prix Nobel de physique 2012.
nine steps of evolution without double well potential; (b) the experimental density matrix elements reconstructed by QST after nine steps of evolution without the double well potential. The exploitation of quantum weirdness for computing is one of the great goals of modern physics. It’s promise is dramatic for a wide range of number-crunching tasks. But quantum computers have another trick up their sleeves which is sometimes forgotten–the ability to simulate other quantum systems. Physicists have already shown how quantum computers of various types can simulate phenomenon such as quantum phase transitions and the dynamics of entanglement–things that classical computers simply cannot handle. There is one quantum phenomenon, however, that has never been simulated–tunnelling. This is the ability of quantum particles to cross a barrier without seeming to have passed through it. There’s no reason in principle why quantum computers can’t simulate tunnelling. The problem is the complexity of the task. The simulations performed so far have all involved so-called analogue processes which are relatively straightforward. The idea here is that the mathematical description of one system, its Hamiltonian, is exactly reproduced in another system. So watching one system tells you exactly how the other would behave. This is known as analogue quantum particle simulation and it works well provided you can find systems that match in required way. Watching quantum phase transitions is good example because many systems share the same mathematical description. For more complex problems, physicists have recently been thinking about another approach. The idea here is to break the mathematical system into different parts and simulate them separately. This is known as digital quantum particle simulation and it has huge potential for events that involve more than one object, such as quantum chemistry and tunneling. The problem is the sheer complexity of these calculations, which require numerous quantum logic gates processing dozens of qubits. 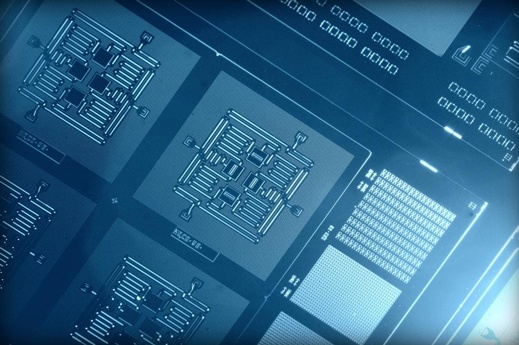 That’s always been beyond the state-of-the-art for quantum computing. Earlier this year, however, Andrew Sornborger at the University of Georgia in Athens showed how the case of a single particle tunnelling through a barrier could be made simple enough to simulate on today’s quantum computers. Such a demonstration would be the first example of a digital quantum simulation. And today Guan Ru Feng and pals at Tsinghua University in Beijing say they’ve done it. To simulate tunnelling, these guys used a quantum computer that relies on nuclear magnetic resonance to manipulate qubits in encoded in the carbon and hydrogen atoms that make up chloroform molecules. They say this is the ﬁrst demonstration of a quantum tunnelling simulation using an NMR quantum computer. 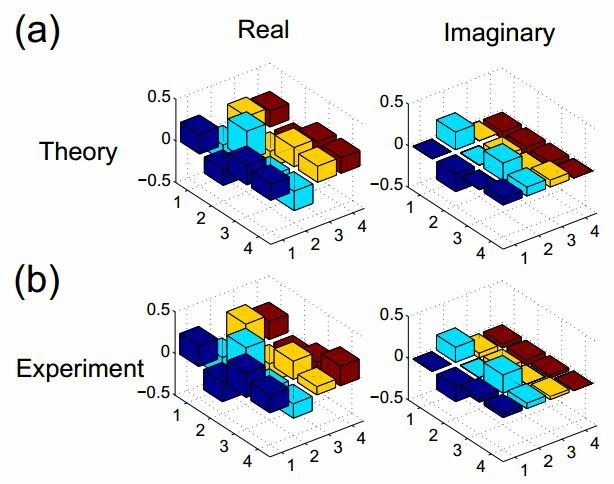 That should open the floodgates for more digital quantum simulations in future. It’s significant because this approach has the potential to simulate much more complex quantum phenomenon than is currently possible. Expect to see more of it.